A month ago, an upcoming Moto mid-range phone, called the Z4 Play was revealed in some unofficial renders. And here are the Moto Z4 Play leaked tech specs. The handset is rumoured to be equipped with a 6.22-inch Super AMOLED display that has a U-notch, which is slightly larger than the waterdrop notches which many phones have. It was initially believed that the Moto logo will double up as a fingerprint scanner, but it appears that the Z4 Play will house an in-display fingerprint scanner. 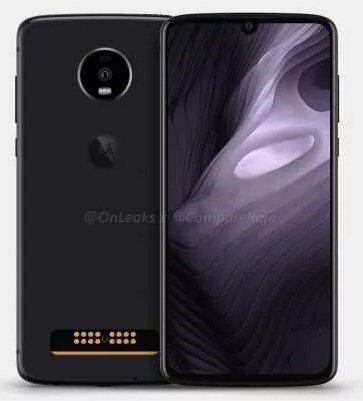 The Moto Z4 Play leaked tech specs reveal that the main lens on the back panel is a 48MP camera with a Q Technology S5KGM1SP sensor. It remains unclear whether it will be the only lens on the rear, but the robot-face dial indicates that it might be the case. According to a report by 91Mobiles, the Z4 Play will be powered by a Qualcomm Snapdragon 6150 (Snapdragon 675) processor, and runs on Android 9 Pie. The device will be available in two variants with: 4GB/6GB of RAM with 64GB/128GB of storage. The Z4 Play is said to pack a 3,600 mAh battery. The Moto Z4 Play will support Moto Mods (speaker, power pack, etc) to allow the user to customize their device with various accessories like the ones on the like the ones used on the Moto Z2 Force, Z2 Play, Moto Z and the Moto Z Play. The Moto Z4 Play is expected to be launched before Q2. The technical specifications may appear to be mid-range, but we think that the mods support will undoubtedly result in a premium price tag for an otherwise decent device.